Today was our latest after school DDR event, and I’m pretty much ready to declare it a failure now. We only had 5 participants today, and while there were some reasons that could have prompted an especially low turnout (first warm afternoon this year on a school day, fewer posters due to a printer failure) the fact remains that we’ve never had much luck with this program. First of all, we’ve been unable to attract an audience during that time. Our 5-8 session have done great, but we just can’t get teens to come right after school. But also DDR has not been the draw that we hoped for. 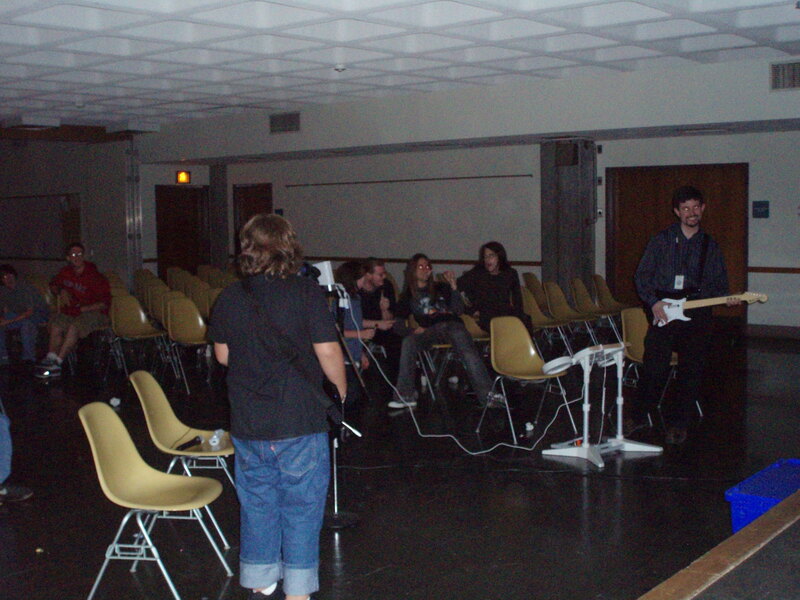 Even those that came wanting to play quickly got bored and we’ve had to switch over to Rock Band every time. I know other libraries have done very well with DDR, but I suspect we’ll never be one of them. Just when you start to think that the world’s image of libraries is begining to catch up to the reality, something like this (via Halfawake) has to happen. Yes the state auditor of Nebraska is investigating a library for daring to purchase a Wii and for trying it out on work time. Furthermore, the state was spurred on by a local news report that all but condemed the library for being a library. Oh, and we’re only talking about $400 or so to begin with. So, a story about my new favorite patron for those doubters that are still out there. We have a high school student who came to my library a few weeks back to meet a student he was helping to tutor. While there he toured our remodeled local history department, gushed over our new equipment, and learned of our monthly Rock Band nights. He also found out that I had challenged some of the players in the past and instantly threw down the gauntlet with me. So he showed up, brought some friends, lost (but only because he selected one of my best songs), and promised to come back with more friends next month. He’s also going to advertise our game nights on the high school’s radio station, and he even gave an impromptu speech to his scout troop about how the library’s not just about books anymore. You can’t ask for better word of mouth than that. Our Wii was one of the best investments we’ve made, and the up front cost for it was nothing when you consider how many programs we’ve been able to run using it (hiring a children’s performer can cost a few hundred for a single show). So Nebraska, get with the program (not to mention the 21st century) and don’t ostracisize a library for doing something that will continue to let it be a vital part of its community. Our first video game night was a huge success. We drew a crowd of 86, which was incredible compared to the rest of our teen programing events. But man am I exhausted . We went all out for this event. Four of us kept things running, with some extra help from the youth commission. Our director and a rep from the friends were also in the audience to keep an eye on things (and in the case of the friends to see how their investment panned out, they were happy). We drew a great crowd too. I’ll admit to having been a bit worried, partly because we had no idea how many people to expect, and partly because of worries over the vastly different skill levels of those who came. The later actually did pose some problems as the less skilled players tended to fail out of their turns quickly. But the kids we got were great, with many of the better players chipping in to help the others. I began the night by playing a tech support role, which was quickly rendered unnecessary. Which was great for the second half of the night when (after a little coaxing from our childrens librarian) I challenged anyone who was willing to a guitar dual. I was really surprised by how much the audience actually got into this. The biggest cheers of the night came from this portion actually. For quite a few the people there this seemed to be the highlight. But despite the fact that I’ve already been issued challenges for the next time, we may change how we run it again. Too few people get to play, and after playing 12 of the hardest songs on expert in a row I can barely feel my arm. The current thinking is that we’ll just do it as a winner stays on sort of thing. But then maybe I’ll be recovered in time for next month. We’ve got a few other glitches to work out as well. We could probably use to do a better job of organizing the order of play. We also really need to improve the sound. We tried to tap into the speakers in our auditorium and we failed compleatly. We wound up having to use the ones embedded in our projector, which worked okay for the people playing, but was nearly impossible for the audience to hear. 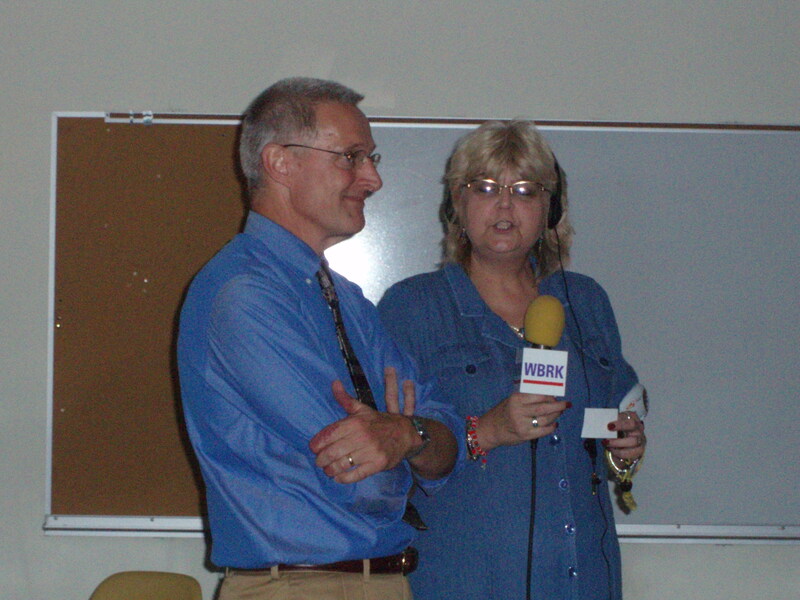 Although it may have worked out okay for the radio broadcast in the back of the room (getting interviewed live with a time limit was a bit weird). But we’ve got a month to improve on that and we’ve got an incredible base to build on right now. Despite my current exhaustion, I can’t wait for next month to come. I’m now I week away from co-leading my first teen video game night at the library, which I’m very excited about, along with everyone else at the library. However, I feel myself increasingly becoming a bit of a buzzkill about it. You see, quite a few of my co-wokers have been raving about what a great and innovative thing this is that we’re doing. And I can’t help but point out that by doing this I feel we’re just playing catch up with the rest of the world. For one thing, we’re hardly the first library to hold a game night, and due to scheduling we actually will not be participating in the gaming in libraries day next month. Now yesterday a new PEW study was released in which 97% of teen respondents said they played video games. Thus we are not going to be offering anything that isn’t already a part of the lives of each of our attendees. What we will be doing is offering a social venue for these games, which the same survey says iswhy 2/3 of those respondees play games in the first place. So my grandparents are visiting currently and the very first conversation we had regarded libraries. They come from Broward County, which has the 9th largest library system in the country according to their publicity, and thus have had a few somewhat unrealistic expectations for the libraries out here. Their main concern is programming, namely that we pretty much have none at my library while theirs has a full time program planner on staff. I think this is worth pointing out because in their minds programs are a core service for libraries, and this is an expectation that I think more and more patrons are begining to have. And taking this to the next step, if this is a core service then shouldn’t we be funding it accordingly instead of basing programs entirely off of the scraps of money our Friends group manages to earn? Of course being realistic there isn’t money there for such a service in most situations, but I’m thinking that we could probably do a better job than we have been of making the case for it. I’m lucky to live in a city that’s trying to reinvent itself with a culturally based economy so there’s a certain amount of willingness to hear us out on this (that’s partly how we got our Wii), but ultimately we have to plead at the state level for funding, and for that we need some more voices out there.